Thanksgiving may not be known as the most expensive holiday in the winter season, but costs can add up quickly. Between travel, décor, and dinner it’s easy to go ham and overspend. 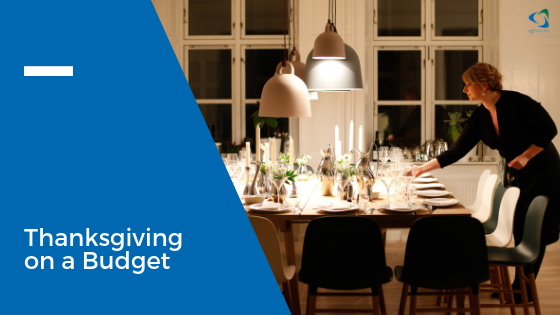 Use these tips from PCU to host a great Thanksgiving on a budget! We give this advice a lot, but that’s because it’s good advice! Before you decide pumpkin or pecan pie, sit down and look at your accounts and expenses. Until you know what you can spend it will be hard to make a dinner that works for you. Stick to ingredients that are not pre-made or boxed. Often, you’re just paying for packaging and branding for items like pre-made pie crusts, spice mixes, or boxed stuffing. Stick to your Thanksgiving budget. Make your dollar go further by buying fresh, canned, or frozen ingredients and making your own dishes. You may be tempted to make a large spread, but you don’t really need 15 side dishes. Choose 3-4 crowd pleasers and no one will miss your great-aunt’s squash casserole recipe! You may also have a less stressful day and enjoy more time with family and friends. You don’t have to do everything yourself this Thanksgiving. Ask for help and invite your guests to bring a side dish or dessert of their choice. You can take care of the turkey and stuffing, and still split costs! If you’re only cooking for your immediate family, find a friend in the same situation. You can split things like flour, salt, other baking necessities, the turkey and more! If you split groceries, you’ll save costs and won’t have a leftover turkey in your fridge until Christmas! The holidays can be hard on your wallet, but PCU is here to help. Use these tips, and check out some of our other resources on budgeting for the holidays. We also provide personal loans and holiday club accounts that can help make this the best holiday season yet!